Skirted and tumbled. Click on photo to enlarge. $30 per pound includes shipping. (entire blanket is $120) Smaller amounts available. $1.75/oz. Call 856-495-7536 for details. 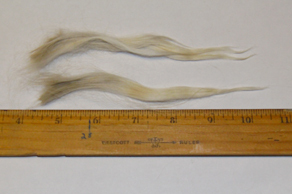 Freshly shorn -- Suri Fleece locks are long, fine, soft, durable, luxurious & silky. Alpaca fleece is warmer & stronger than wool but not itchy! Skirted and tumbled, clean fleece, very little VM - will be a pleasure to spin! 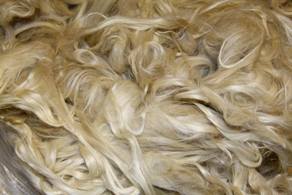 Freshly shorn alpaca fleece is perfect for all your fiber projects, ready to spin! Luxurious & strong, great for crocheting, knitting, weaving, felting or other fiber crafts. One of a kind!